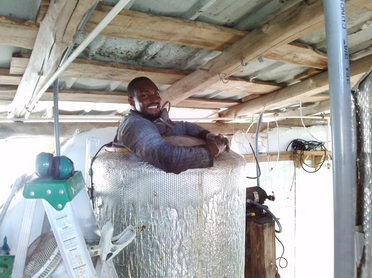 In November 2014, the Biodiesel program at The Island School began an upgrade to the biodiesel manufacturing equipment. The update, which was recently completed, drastically improved the speed at which fuel is produced and also improves the quality of the end product. The upgrade included the installation of a drywash tower, a methanol recovery unit, and reconfigured the entire facility with new plumbing, pumps, flow meters, and electrical controls. Biodiesel Lab Technician Samuel Dorsent got up close and personal with CSD’s biodiesel manufacturing equipment as it was cleaned in preparation of the upgrade. Sam has been working with the biodiesel program since May 2014. The Drywash Tower replaces the previous method of cleaning processed fuel, which used water. The dry wash tower shortens the production time to process 150 gallons of biodiesel to two days, as opposed to 10-12 days as previously experienced. This has increased our production capacity to well over 30,000 gallons per year, nearly 4 times our previous capacity, and well above our current fuel demand. On a yearly basis, the drywash tower saves the school nearly 20,000 gallons of water, over 750 man-hours of labor costs, and drastically reduced production costs. 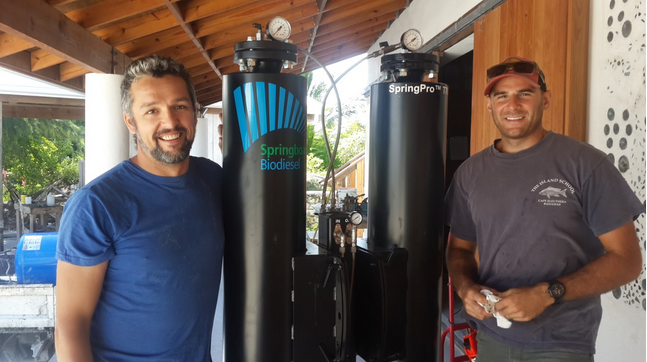 Corey Broderick and Mike Cortina (F’02) stand next to the new SpringPro T76 Drywash Tower. A secondary piece of new equipment installed is a Methanol Recovery unit. As the name would lend you to believe, the methanol recovery unit enables the recovery of excess methanol from the glycerol waste stream of the biodiesel reaction. The recovered methanol can be reused back into the production cycle and offset a portion of the methanol the program needs to purchase and import from the US. The methanol recovery unit has the potential to reduce the cost of biodiesel production by over $0.20 per gallon; and since methanol is the most expensive of the three chemical ingredients that make biodiesel, financial savings are felt on a very short time scale. 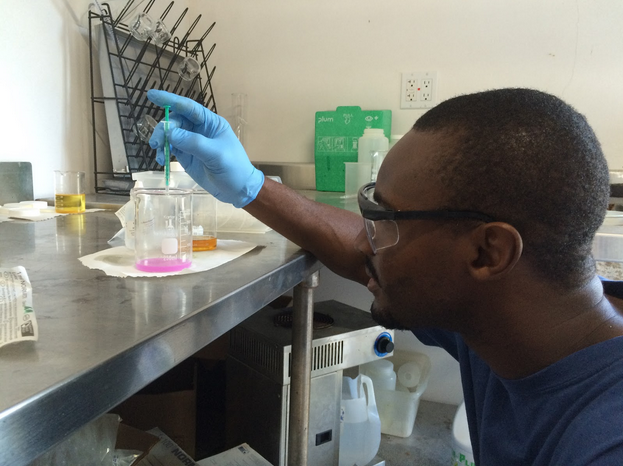 Sam performs a titration on a sample of oil prior to reacting a batch of biodiesel. The biodiesel program at Island School began as a student run research project in the fall semester of 2002. Currently, the Organization uses biodiesel in vans, surfs, trucks and backup generators. We will soon begin testing biodiesel in boats, which has the potential to save the organization significantly in fuel expenditures. B100 (100% biodiesel) burns much cleaner and more completely than diesel fuel from other sources, such as fossil fuels. On average, a reduction of 60% in particulate matter, 60% in carbon monoxide, 70% in unburnt hydrocarbons, and 100% in sulfur dioxide can be expected. Moreover, the main chemical ingredient in biodiesel is used cooking oil; a perfect example of a renewable source of fuel. If you have any further questions, or care to learn more about the biodiesel program at The Island School, please email biodiesel@islandschool.org.